A team of 50 chefs as part of a government-led initiative on Saturday created a Guinness World Record by cooking a mammoth 918 kg of "khichdi". "It has calcium and all necessary vitamins. It can be a solution to address the issue of malnutrition. The world record will help khichdi to find space in global menu and it can be an alternative to fast food," Ramdev said. 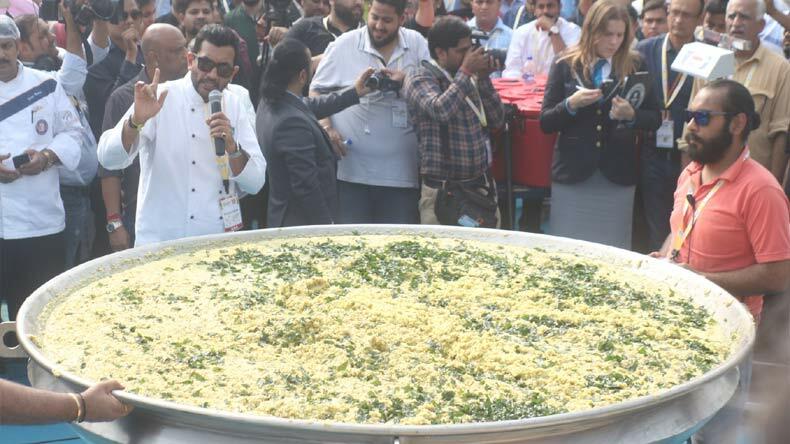 A team of 50 chefs as part of a government-led initiative on Saturday created a Guinness World Record by cooking a mammoth 918 kg of "khichdi"
A team of 50 chefs as part of a government-led initiative on Saturday created a Guinness World Record by cooking a mammoth 918 kg of “khichdi”. As the clock ticked towards 12 pm — time scheduled for the khichdi to get ready — people around, mostly media persons, started growing restive. They eagerly waited for the mammoth dish to be presented before them so they can capture the moment in their cameras, which was set to become a world record. However, they had to wait for a while after famous chef Sanjeev Kapoor, who headed the project, sought more time. With the arrival of yoga guru Baba Ramdev and Union Minister Harsimrat Kaur Badal, who were to launch the khichdi, the festivity started gathering momentum. They launched the Brand India khichdi, which was cooked using 800 kg of grains in a big ‘kadhai’ (wok) of 100 litres, by adding ‘tadka’ to it. Multi-grains such as rice, bajra, and ragi, as well as pulses, vegetables, amaranth and spices were used in the khichdi. Guinness World Record officials, who were present, announced later that Brand India Khichdi had made it to the record books. Ramdev said khichdi was a nutritious food and it was globally accepted. “It has calcium and all necessary vitamins. It can be a solution to address the issue of malnutrition. The world record will help khichdi to find space in global menu and it can be an alternative to fast food,” Ramdev said. Imtiaz Qureshi, first chef to receive the Padma Shri award, said it was time for khichdi to become global dish. “I introduced biryani and pulav to 5-star hotels, which then became global dishes. Now, khichdi is set to become global dish thanks to its taste, nutritious value,” he said. Commenting on the death of an 11-year old Jharkhand girl due to non-linking of Aadhaar with the ration card, Ramdev said hunger and malnutrition were shameful for the country and khichdi might help in addressing the problems.